Location: Located conveniently at 92 Nguyen Huu Canh Street, Ward 22, Binh Thanh District, HCMC, along the Saigon River, on the fringe of District 1, only 5 minutes travel time from Saigon Pearl to the city centre. Due to excellent location close to the centre business district and bordering the Saigon River, the name of Saigon Pearl has been chosen for the largest property development project in Ho Chi Minh City. Developer's objective: Saigon Pearl is designed to provide an all-in-one-fully-serviced, high quality commercial, high- rise residential and office facilities, complemented with professional landscaping and management services. 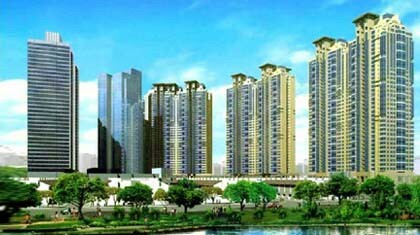 Saigon Pearl will set a new standard for high quality urban lifestyle in Vietnam. Scale & Service: The Saigon Pearl project includes 6 apartment buildings of 37 storeys each, 2 five-star hotel and commercial complex. The project will develop over 2,000 apartments for sale to the local and also the neighborhood community at large. The project also includes the construction of 40,000 square meters retail and recreational facilities including clubhouses, a large-scale shopping complex with shops, supermarkets, cinemas and other entertainment components. In addition, there will be a kindergarten, an international school, and undercover parking lot that can accommodate over 1,200 cars and 9,000 motor cycles. All services and amenities at Saigon Pearl are first class including telecommunication service (high- speed internet, satellite TV,...), professional security service, English style housekeeping service, 24- hour backup power, safety central gas system and modern water processing system. Saigon Pearls 5- star services and endless amenities will satisfy your every need. + Ruby Tower 1 (Tower 1): 37 floors with 264 apartments, 4 penthouses and 4 duplexes. + Ruby Tower 2 (Tower 2): 37 floors with 264 apartments, 4 penthouses and 4 duplexes. + Topaz Tower 1 (Tower 3): 37 floors with 264 apartments, 4 penthouses and 4 duplexes. + Topaz Tower 2 (Tower 4): 37 floors with 264 apartments, 4 penthouses and 4 duplexes. + Sapphire Tower 1 (Tower 5) : 37 floors with 264 apartments, 4 penthouses and 4 duplexes. + Sapphire Tower 2 (Tower 6) : 37 floors with 264 apartments, 4 penthouses and 4 duplexes.